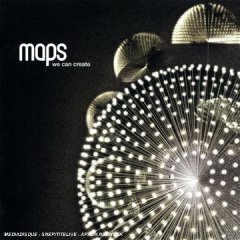 Maps is the pet project of Northampton electro-head James Chapman and We Can Create is his full-length debut. The disc is a mix of shoegaze and New Order, a digital aquarium in which synthetic swims with organic. The synthesizer roadways mix with Chapman’s breathy vocals and his continental drift of beats and rhythms create a distinctive world. Although Chapman’s sound is alluring, his execution is faulty and meandering. All too often, We Can Create lulls itself to sleep under the weight of its own production and an absence of true substance. Maps has a pins-and-needles sound as bristling as the fiber optic snow globes that dot the liner notes. This sound is evident on tracks like “Elouise” where cavernous percussion keeps pace with the shower of diamond dagger synthesizer. “You Don’t Know Her Name” twirls out with garbled synthetic gibberish reminiscent of Mogwai and Chapman’s projection of the title lyrics have a forceful intensity that burst forth as if from a clogged pipe. This song is an example of Chapman getting his formula correct, matching ethereal fervor with dreamy landscapes. Chapman runs into problems fairly quickly and his moments of solidarity fall apart under the overall scheme of the record. Some songs are too long and unvaried to have any lasting impact. The somber “Glory Verse” runs along like an Iowa road with its frustrating lack of a climax. It’s pretty, yet wholly dull, sounding like digital New Age without the lutes and flutes mixed with the worst of Death Cab For Cutie. We Can Create demonstrates a case where the lyrics and vocals are divorced from the music, scribbled down and recorded without any kind of synergy with the accompanying instrumentals. When you’re making a sound with largely ambient sounds and manufactured beats, you need tight vocal melodies or else run the risk of tedium. Chapman runs into this trap all too often which begs the question of whether or not We Can Create would have been a better album sans the vocals altogether. Sometimes the lyrics are downright stupid, like on the laborious “Don’t Fear.” Chapman drones “don’t fear the sun/feel like someone” over and over again to garish excess. The music is nearly as uninspired as the tepid vocals, with only a raking distortion effect making any kind of ripples in this inert song. We Can Create demonstrates that this fledgling act could benefit from going back to the drawing board. Chapman needs to restructure his sense of purpose before unleashing his production talents on a follow up.